Next February Article 25, the UK-based charity for building solutions to global problems, hopes to start construction on two clean water plants to combat lethal cholera in Haiti. Both installations are proposed for existing schools that lie inland away from the zone devastated by the earthquake in January 2010, but they draw water from rivers infected with cholera. By providing schools with clean water free of cholera, Article 25 is confident that these improvement works should save the lives of some of the country’s poorest and most vulnerable children. The proposals have been drawn up by Robin Cross, Article 25’s director of projects & acting CEO, who visited both schools in July and submitted a detailed feasibility study in August. Article 25 has been appointed to design and supervise the installations by two international funding organisations, Outreach International and Just a Drop, along with a local social development agency, ODSI. Working together, these four international organisations will sponsor, supply and fit clean water supplies combined with wider sanitary improvements in both schools. The installations are designed to be sustainable, firstly by harnessing renewable resources, and secondly by comprising basic, low-tech kit that can be inexpensively managed and maintained by the local communities themselves. Both schools are located in the Central Plateau region of the country, an area with a long standing history of cholera resulting from poor sanitation and foul water supply. 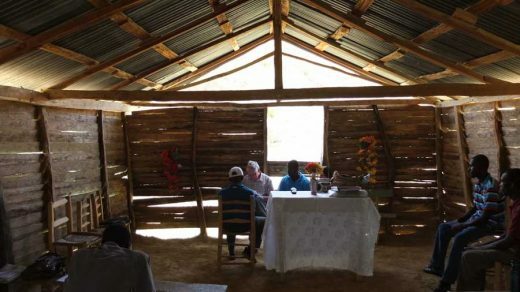 At one site, Malte Peralte, the school building is a basic timber shack with a crinkly-tin roof. It lacks both latrines and water supply, and relies on water drawn from a cholera-contaminated river 20 minutes walk away. However, the Central Plateau region does benefit from plentiful rainfall, which Cross plans to put to good use. He proposes to fit gutters and downpipes to the roof of Malte Peralte’s existing school building. From the roof, rainwater will be filtered and drained into a new storage tank installed nearby, either above or below ground. From there, the water will be piped up to high-level header tank, ideally by means of an electric pump powered by a small photovoltaic array. From this high location, clean water will feed by gravity back down to a tap and basin for drinking and hand-washing. New hygienic pit latrines are also to be built at some distance from the tanks to avoid cross contamination. Finally, the life of the existing building will be extended through limited repairs to the roof beams and crinkly tin covering. Detailed design by Article 25 is due to begin this month. Then next January, the charity will advertise for a project manager who, Robin says, “must be French-speaking, technically able and ideally on a career sabbatical from the UK.” In the same month, tenders will be invited from local building contractors, including ones that have worked with Article 25 in the past. Another two schools were visited on the same trip by Cross, who reckoned they would require more extensive works. One of these schools is larger and lies at Petionville closer to the capital of Port au Prince. Here, improvement works could feasibly start during next summer holidays, when it will be free of children. 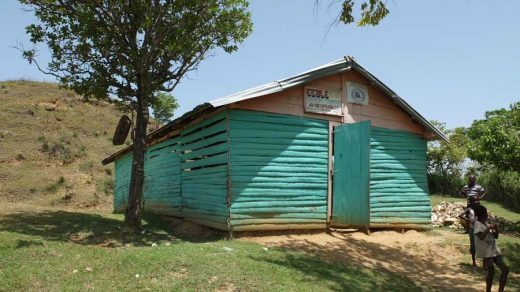 But the fourth school at Thomassique turned out to be blighted by structural defects and will need to be rebuilt before sanitation works can be carried out. The trip also included revisits to sanitation projects already completed by Article 25 and Just a Drop. They included De Michel school, where rainwater is now collected from the rooftop, filtered, stored and recycled for drinking and hand-washing, just as is currently proposed for Malte Peralte and the other three schools. By greatly reducing the risk of water borne disease such as cholera, Cross believes that these modest improvements have made a dramatic difference to the school children’s quality of life.